After Cindy and Jim Green discover that they cannot have children, the write a list of all the things their child would have been and bury it in the backyard. After a freak storm over the Green's house, a child suddenly appears and is everything the Greens have ever wanted. They are thrown into the ring of parenting with zero experience, and desperately attempt to keep their new child from being bullied about the mysterious leaves growing from his legs. I have been interested with this movie ever since it first came out when I was thirteen years old. When I finally had the chance to watch it, I was very excited. And yet, the film didn't exactly live up to my expectations. The movie begins with Cindy and Jim Green applying to be adoptive parents. The case worker asks them how they are qualified to become parents. Cindy and Jim begin to tell the case worker their story. They tell the case worker that they are unable to have children, and they made a list of things that they wanted their child to be and buried it in their garden. That night, during a freak storm, their dream child seemingly grew from their list. He calls himself "Timothy," which is the Greens' favorite boy name. When told to call the Greens "Mrs." and "Mr," he laughs and calls them "Mom" and "Dad." Cindy and Jim are baffled by this. He also has leaves growing from his legs, which he asks his new parents to pay no attention to. The next day, Timothy is introduced to his extended family. His parents put thick socks over his leaves and warn him not to say too much about himself in front of their "proper" family. Of course, things don't turn out exactly as expected. Timothy asks unknowingly rude questions of his new cousin and takes time to "eat" (take in sunshine) in the middle of a dodgeball game. His "proper" family does not approve. Cindy and Jim take Timothy to a botanist friend of theirs to see if he can take off Timothy's leaves. He tries, and his clippers break in the process. The botanist finds Timothy's leaves amazing and fascinating, but cannot explain why they are there. The family decides to continue to hide Timothy's incredible secret with long socks. Timothy begins to change the lives of the people he comes in contact with. His new Uncle Bub enjoys Timothy's humor, while a girl from school likes Timothy because she, too, has a secret. He makes his parents think outside the box, and to say what they want to say even when it's hard. He joins a soccer team, and while he doesn't play, he cheers his team on and helps out any way he can. He is a cheerful child, and yet his parents can see that he is keeping something from them. What can it be? This movie interested me, but it felt like something was missing the entire time. The parents seemed very shallow and too eager to please their child and their family. Timothy was a very sweet kid, but he seemed almost too sweet with no flaws whatsoever. There were no "normal" or "average" characters. They all had to be extremely something, be it extremely sweet or extremely cruel or extremely successful. The story was very good, though. 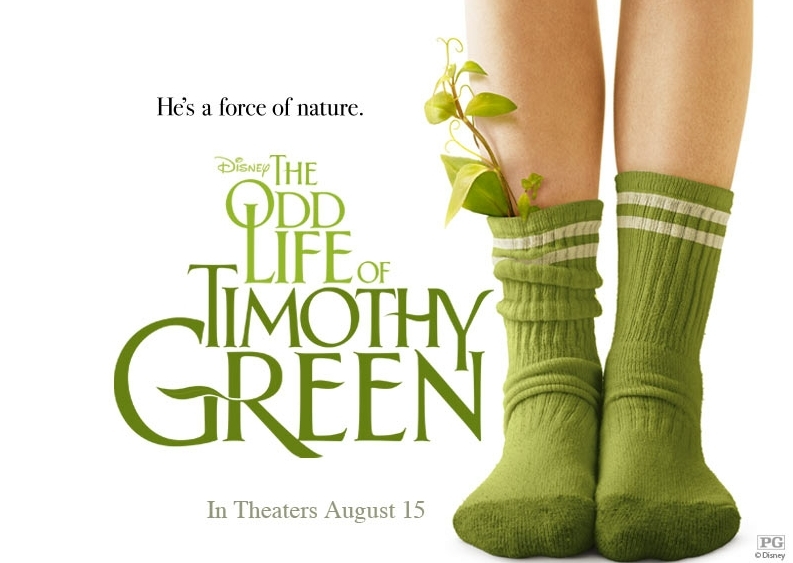 Have you seen The Odd Life of Timothy Green? What did you think about it?